The leather portfolio is the height of understated elegance, compact and functional, with the luxurious feel of natural leather. Available in black,burgandy & tan the zippered central compartment is divided in two, with an organizer in one half to hold business cards, pens and small items such as your cell phone & other compartment to hold your laptop. Two outside pockets create additional storage space. As well as two handles, the bag sports an adjustable shoulder strap, which detaches when not required. Packaging Details Each pieces are packed in plain Shining poly then into Master box. Each box with white label on it indicating Item No & color for reference. Master packing in corrugated box with packing list attested. Proper precaution are taken care such us inside full polythene & silica gel are put in all the packages to make Leather bags free from absorption of moisture and fungus. In order to have less transit time we shipped our consignment from reputed direct linear such us MSC/Mearsk & Transworld. 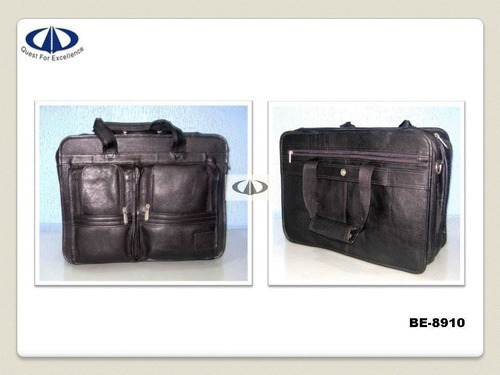 An industrial experience of more than 2 decades has enabled us to live up to the expectations of our clients by offering a qualitatively superior range of leather goods, leather hotel items, garment accessories. With the help of our team of experienced designers & craftsmen, we are successfully catering the requirement of our clients with various fashionable accessories. Further their in-depth knowledge of the domain also helps us to bring high level of customization in our range. In order to produce novel designs, we have deployed latest techniques and skilled manpower, ensuring our clients get value for their money. Eye catching designs and high on sophistication, our gamut has been widely appreciated by clients across the globe spread in countries such as Middle East, UK, USA, Denmark, Australia and Newzealand. "WE DO NOT DEAL WITH DOMESTIC DEALERS AND TRADERS"